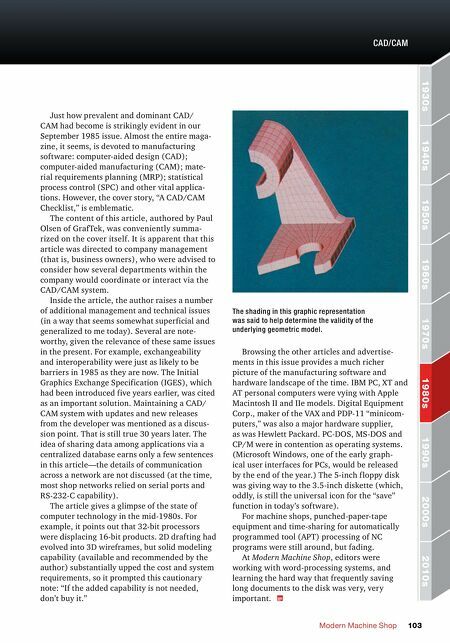 Modern Machine Shop 103 CAD/CAM 2010s 2000s 1990s 1980s 1970s 1960s 1950s 1940s 1930s Just how prevalent and dominant CAD/ CAM had become is strikingly evident in our September 1985 issue. Almost the entire maga- zine, it seems, is devoted to manufacturing software: computer-aided design (CAD); computer-aided manufacturing (CAM); mate- rial requirements planning (MRP); statistical process control (SPC) and other vital applica- tions. However, the cover story, "A CAD/CAM Checklist," is emblematic. The content of this article, authored by Paul Olsen of GrafTek, was conveniently summa- rized on the cover itself. It is apparent that this article was directed to company management (that is, business owners), who were advised to consider how several departments within the company would coordinate or interact via the CAD/CAM system. Inside the article, the author raises a number of additional management and technical issues (in a way that seems somewhat superficial and generalized to me today). Several are note- worthy, given the relevance of these same issues in the present. For example, exchangeability and interoperability were just as likely to be barriers in 1985 as they are now. The Initial Graphics Exchange Specification (IGES), which had been introduced five years earlier, was cited as an important solution. Maintaining a CAD/ CAM system with updates and new releases from the developer was mentioned as a discus- sion point. That is still true 30 years later. The idea of sharing data among applications via a centralized database earns only a few sentences in this article—the details of communication across a network are not discussed (at the time, most shop networks relied on serial ports and RS-232-C capability). 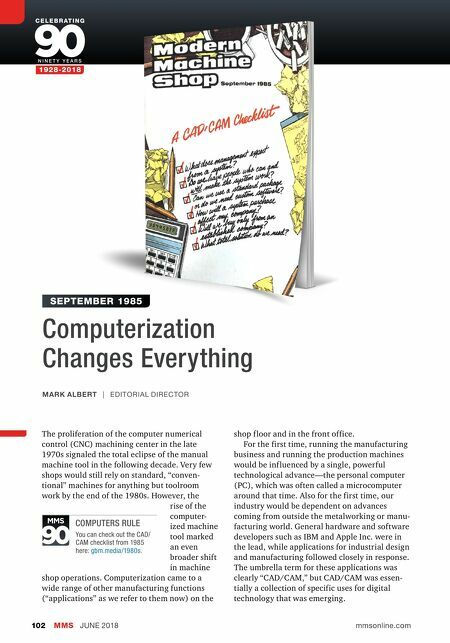 The article gives a glimpse of the state of computer technology in the mid-1980s. For example, it points out that 32-bit processors were displacing 16-bit products. 2D drafting had evolved into 3D wireframes, but solid modeling capability (available and recommended by the author) substantially upped the cost and system requirements, so it prompted this cautionary note: "If the added capability is not needed, don't buy it." Browsing the other articles and advertise- ments in this issue provides a much richer picture of the manufacturing software and hardware landscape of the time. IBM PC, XT and AT personal computers were vying with Apple Macintosh II and IIe models. Digital Equipment Corp., maker of the VAX and PDP-11 "minicom- puters," was also a major hardware supplier, as was Hewlett Packard. PC-DOS, MS-DOS and CP/M were in contention as operating systems. (Microsoft Windows, one of the early graph- ical user interfaces for PCs, would be released by the end of the year.) The 5-inch f loppy disk was giving way to the 3.5-inch diskette (which, oddly, is still the universal icon for the "save" function in today's software). For machine shops, punched-paper-tape equipment and time-sharing for automatically programmed tool (APT) processing of NC programs were still around, but fading. At Modern Machine Shop, editors were working with word-processing systems, and learning the hard way that frequently saving long documents to the disk was very, very important. The shading in this graphic representation was said to help determine the validity of the underlying geometric model.